It is always an exciting prospect for me to repurpose technology. Tungsten has the same density as Gold, so it should make an efficient bow wrapping material. I recently discovered that Gold plated Tungsten wire is used on high end copying equipment as a corona discharge media. It appears to be malleable. Very cool Irv. That should look great!!! The person selling this material said that it would easily wrap around the diameter of a wooden pencil. Unfortunately, he is selling it $2/ft plus shipping. I got over a pound of regular tungsten wire without any plating to practice with. I ran some numbers on the cost of a gold plated tungsten wire wrap. The frog end of my carbon bow is 0.36” thick. Assuming a 1.5 inch long wrap and a wire thickness of 0.01” I would need 150 wraps. This equates to 170 inches of wire, or about 14 feet. At a cost of $2 per foot, the material cost of the wrap is $28. No cheap, but doable. Cool. Are you doing it? I just purchased over a pound of 99.5 percent pure tungsten wire (sort of a grey color). I don’t think that I will be able to use a wrap machine with it, since it appears to work harden very quickly. Hand wrapping should work fine, since it can bend around a tight radius without a problem. Another concern is that Andreas Grütter wrote that when he removes silver wrap on older bows (designed to work with gut strings), their sound dramatically improves. I don’t want to spend the time on split bamboo bows, and damage the sound with a wrap. I will surely try it on something, and will provide a picture or two for sure. 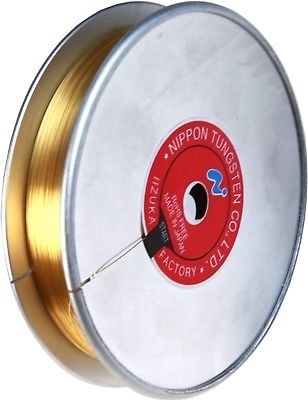 It is strange that gold is the standard as a bow wrapping material, and I cannot find any reference on the use of tungsten, which has an identical density. Just a guess, Tungsten was not really used much until early 1900 and then it was for lighting filaments, by then the use of Gold and Silver, whale bone etc. was well established and some times traditions out weigh's new ideas. Hi Fiddlerman. I have not completed my bow wrapping machine and I don’t have a bow in need of wrapping, but the tungsten has arrived and I am anxious to see the weight of the wrap. I am going to “cave man” it and use a weighted phone book to tension the wire. I am going to wrap it around a new wood pencil for the picture and to arrive at a wrap weight per inch. This will be raw tungsten without any plating. Did you ever find out the gauge of wire your luthiers use? I have just learned that my 0.010” diameter tungsten wire is 28 gauge. 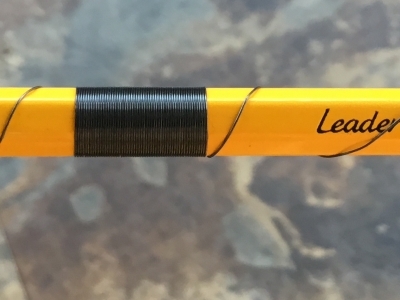 I just did a proof of concept wrap of 0.010” diameter tungsten wire on a pencil. I would say the concept worked. I think that the cleanest method of finishing off the ends would be to tig weld them. Solder is not an option. The wire is so stiff that pulling it under the wrap would be difficult. I bet that this stuff would make a great e string.